Motorola seems to be moving away from interesting and niche Moto Mods, likely due to poor sales of anything that isn't a backplate or battery. The only interesting Mod to be come out recently was the gamepad accessory, but now there's another noteworthy Mod on the horizon. The company has announced a 'Power Pack & Digital TV' mod, but it probably won't be coming to the United States. 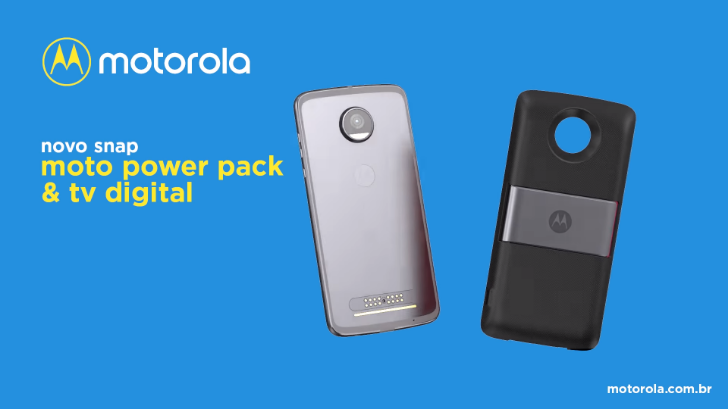 Support for the new Moto Mod with Digital TV: Moto Power Pack & Digital TV. After some digging, we found the Mod on Motorola's Brazil website. It's not on sale yet, but you can sign up to receive an email when it becomes available. As the name suggests, the Mod allows users to watch Digital TV broadcasts from a Moto Z device. Customers will also get six free months of Globo (a Brazillian TV service) when they buy it. It's very unlikely this mod will arrive in North America, since Brazil uses a completely different technology (ISDB-T) for TV broadcasts than Mexico, Canada, and the US (ATSC). Still, it's definitely one of the more practical Moto Mods the company has made. It will cost R$ 399 when it is released, which is roughly $120 USD.